Workers operate on "The Miraculous Journey", an art installation by artist Damien Hirst outside the Sidra Medical & Research Centre in Qatar's capital Doha, on the day of their unveiling on October 10, 2018. 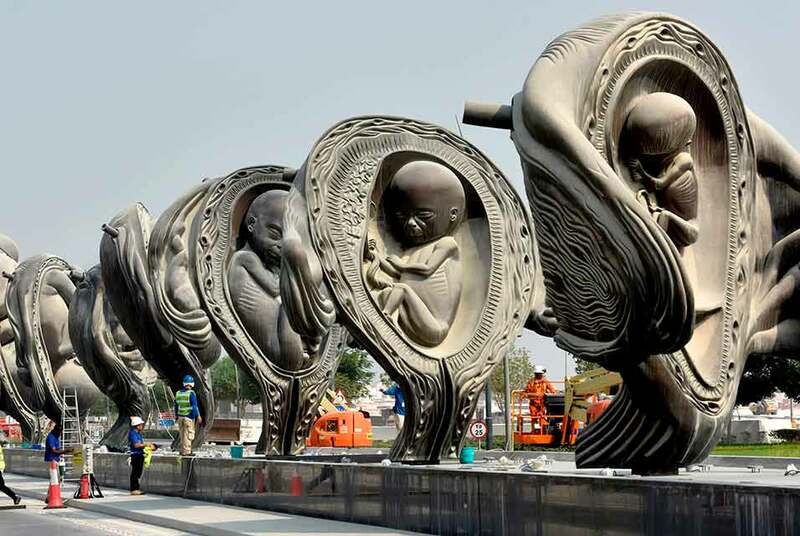 Fourteen giant bronze sculptures by British artist Damien Hirst graphically documenting the moment from conception to birth have been officially unveiled outside a new hospital in Qatar. "The Miraculous Journey", which culminates with a 14-metre (46-feet) statue of a just-born naked baby, is the eye-catching centrepiece of 65 separate works at Doha's Sidra Medicine Hospital, forming possibly the largest collection of art at any medical facility anywhere in the world. STRINGER / AFP. DOHA (AFP).- Fourteen giant bronze sculptures by British artist Damien Hirst graphically charting the moment of conception to birth greet patients arriving at an $8-billion hospital in Gulf state Qatar. The vast open-air installation, named "The Miraculous Journey", shows a foetus growing in the womb and culminates with a 14-metre (46-feet) of a naked baby just after birth. The monumental work is the centrepiece of an impressive modern art collection at the Sidra Medicine Hospital, officially opened this week in Doha, that would be the envy of many galleries around the world. "We believe it reflects very much the mission of Sidra, taking care of the healthcare of woman and babies," said Layla Ibrahim Bacha, art specialist with the government-supported Qatar Foundation, which owns most of the artwork. "I think it's perfect for the location, as you can see a lot of people are taking pictures, I think its becoming iconic." Among the 65 works at the speciality facility for children's and women's health are pieces by high-profile international names and artists from across the Arab world, including Qatar. A fourth-floor outpatient clinic is decorated with a neon installation entitled "I Listen To The Ocean And All I Hear Is You" by Tracey Emin, one of Hirst's ground-breaking contemporaries from Britain. Bacha says the art was chosen with "very specific themes" in mind. "They are not meant to be decorative, they are meant to be more creating debates, helping with the patient to keep calm," she said. Syrian artist, Jaber al-Azmeh, whose pictures hang in the hospital, told AFP that it makes him "smile" to imagine his photographs on display in a place where new lives are starting. Sidra began receiving its first patients in January and last month successfully conducted Qatar's first conjoined twin separation surgery. "We are not expecting everyone to like them. We are not expecting everyone to understand them," said Bacha. "This is why they are there to actually create this element of debate, this element of thinking."